Port Network Authority of the Ionian Sea, the managing institution of the Port of Taranto, officially published its first positive evaluation of the proposal of Yilport Holding, Istanbul-headquartered port operator, regarding the concession of the container terminal at the Port of Taranto, Italy. Yilport’s press service informed about it last Friday. In case the concession is obtained, Taranto Container Terminal would be the 21st marine terminal in Yilport’s global portfolio, and the first one in Italy. Taranto is located in the southern Italy, in Apulia, on the north coast of the Gulf of Tarantoof the Ionian Sea. 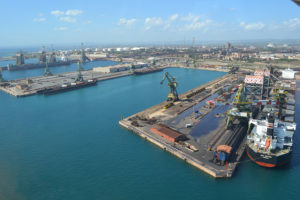 In the early 1960s, the port got a powerful impetus for development when a major steelwork was established here and today the steelmaking industry is Taranto’s biggest customer. The port facilitates discharging raw materials such as coal and iron ore and loading / discharging steel products – coils, pipes, sheets and slabs. Besides, Taranto’s traffic also includes oil and oil products, cement and general cargo. Looking at the port’s statistics, we can’t help noting a steady decline in its throughout in the last years. Thus, by 2017 the total cargo volume dropped 2.3 times since 2006: 21.6 mln tonnes handled in 2017 as compared to 49.4 mln tonnes in 2006. The decrease has occurred in all cargo types, but it is most noticeable in container traffic. Thus, in 2006 the container volume was 892,303 TEU, whereas since 2015 the port does not handle containers at all. However, this may be explained by the massive renovation which is going on at the Multipurpose Pier of Taranto. As a result, the Pier will have 2,100 meters of quayline including 1,500m dedicated for container handling with a draft of 16.5m. The port aims at the container capacity of 2 mln TEU per year. The renovation works are scheduled for completion in 2018. The port is currently seeking for a concessionaire for its Multipurpose Pier. Yilport, a subsidiary of YILDIRIM Group of Companies, made the offer to the Port Authority in early July and now has received its first positive response. The company plans to develop Taranto Container Terminal “as both a gateway terminal, and also a transshipment hub of tomorrow”. Yilport intends to bring in not only containers but also breakbulk, project cargo and ro-ro traffic to make Taranto Container Terminal “one of the best terminals in Italy by 2025”. According to Yilport, the company will heavily invest in the infrastructure, equipment and technology. The first developments and investments will be the installation of STS cranes, RMG cranes and Navis terminal operating system. With these investments, Yilport plans to expand the facility’s annual handling capacity to over 4 mln TEU in the next 10 years.